As you noticed if you watched any of the other NBC comedies last night, it was NBC’s Green Week. Yes, it was an absurd corporate synergy gimmick that the meta-30 Rock was able to skewer even while conforming (who knew Al Gore could act?). 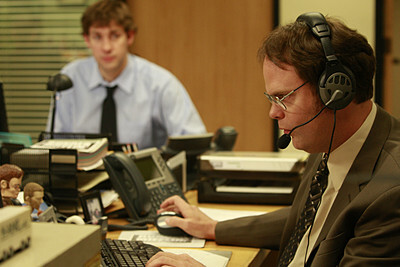 So, like the other shows, the Office had to crowbar in some sort of story that conformed with the “green” theme. In our case, Ryan has a “getting to know you” camping weekend to which he invites several of the middle managers from across the Dunder Mifflin universe- including Toby. Michael… is not invited. So, Michael decides to be Survivorman. Why? I dunno. Outfitted with nothing but a knife (supplied from a hidden office arsenal) and a roll of duct tape, Dwight blindfolds him and takes him out to the wilderness for some… survivaling. Of course, Dwight (the Overkill Killer) is a bit of a Survivorman himself, and so he sticks around to make sure Michael survives his ordeal. What we get are a few predictable riffs on Michael’s ineptitude/underestimation of his own nature skills. In the end, Dwight saves Michael from ingesting poisonous mushrooms and the adventure is over. This subplot felt exactly like what it was: a tacked-on, unnecessary and illogical subplot. The real fun and the real action was back in the office where Jim was in charge. I don’t know about you, but didn’t you always get the sense that, as great a guy as Jim is, he’d likely be a miserable failure as a boss? Well, Jim proves this by making a “rookie” mistake when he decrees that instead of celebrating everyone’s birthday individually, birthdays will now be rolled into one communal bash. The natives predictably rebel against this, and Jim finds that managing everyone’s petty jealousies and bickering is more than he bargained for. The office denizens, for their part, feel that the power has gone to Jim’s head. And Jim begins to display Michael-esque leadership tendencies. He even begins to dislike Toby. In the end, Michael returns to save Jim who is shaken by the realization that there’s a little bit of Michael in all of us. I think this was an uneven episode. The Survivorman subplot was so needless and ill-fitting… but it was paired with one of the more enjoyable subplots about the office’s delicate social order. I support Jim’s push for a communal birthday bash. I can respect the fact that your office wants to celebrate your birthday or other significant life milestones, but we should call a spade a spade, and that is that any “celebration” is an excuse to avoid doing work, and push “socializing” among colleagues, most of which you already spend too much time with. So, instead of buying me a cheap, tasteless cake from the local drug store and force everyone to stand around uncomfortably for ten minutes, take the team out to the bar afterwork and buy a round of beers. That has proven, and always will be, the only way to truly get office colleagues to interact on a true social level. Plus, leaving the work environment usually gets rid of the riff-raff that you don’t want to join in the fun anyways. Hmm. Does someone have a birthday coming up? Are you speaking from experience?